Rodrigo Alves has taken his love of plastic surgery to new extremes by getting four of his ribs removed. The plastic surgery addict, dubbed the Human Ken Doll, enlisted the help of Dr Michael K Obeng after deciding he was 'too fat' to attend any Christmas parties. 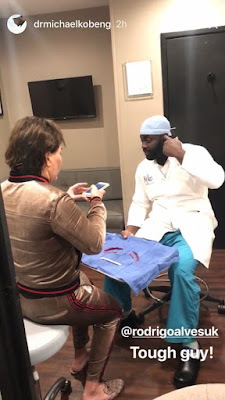 The doctor posted pictures and video of Rodrigo in his offices after he became the first male patient to have his ribs removed. 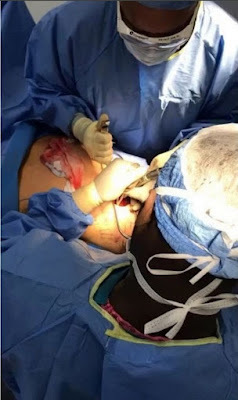 Dr Kobeng posted on Instagram: "Our first male #RibRemoval @rodrigoalvesuk the verdict is out if Rodrigo is the first gentleman to have his #ribs removed!" Rodrigo has now had a whopping 60 surgeries and spent more than £508,000 to achieve his look. His doctor also shared gruesome images of Rodrigo on his operating table as they worked to remove his ribs. Blood-soaked bandages lie on his stomach and an opening is visible where the doctors are using their tools to complete the procedure. And Dr Kobeng later labelled Rodrigo a "Tough guy" as he shared a snap of him after the surgery. » Lady Who Spent £30k Turning Herself Into Human Doll Wants Men To Leave Their Wives For Her!